(F1) Hannibal is another early maturing pumpkin variety that should be considered for short growing season areas. Medium-sized 18-22 lb. fruit with a rich orange color are produced on strong vines that offer intermediate resistance to powdery mildew. The fruit have a uniform size, slightly tall shape, medium ribbing, and dark, strongly attached, medium-thick stems. 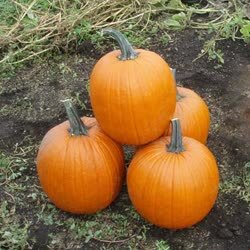 Hannibal pumpkins would also be good to use when planting windows have been cut short due to poor planting conditions.